For big, rich orchestrals in a hurry, there's plenty to recommend here to those on a relaxed budget. Most of the samples sound superb. Wide variety of styles. Ease of use. Sample bank and scripted Kontakt interface don't give much in the way of options or flexibility (one mic position per instrument, for example). Some of the quirkier patches aren't going to prove hugely useful. 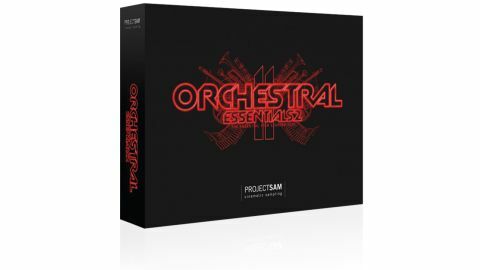 ProjectSAM's second action-packed library of "cinematic" orchestral ensembles draws almost entirely on its Symphobia and True Strike series for its 9.5GB sample bank. Ranging from solo instruments and small groups to full orchestra and choir, the variety of instrument combinations, playing styles and flavours on offer is broad. "The Strings, Brass, Woodwind, Percussion and Keys categories capture the imagination and sound the business"
The 53 instruments are divided into nine categories - Mixed Orchestra, Strings, Brass, Woodwinds, Percussion, Keyboards & Harp, Choir, Sound Design and Bonus. The last two comprise swells, beds, whooshes and other effects, as well as orchestra tuning noises and "concert hall silence", so the meat of OE2 is undoubtedly to be found in the first seven. The ten Mixed Orchestra instruments represent their diverse section combinations very well, and the inclusion of Cartoon and Texture ensembles is a nice touch. The Strings, Brass, Woodwind, Percussion and Keys categories capture the imagination and sound the business, while the five "Legato" patches (solo trumpet, flute and oboe, cellos plus bassoon, and bass clarinet plus contra bassoon), which use sampled legato transitions for realistic and expressive play, are truly gorgeous. There are a few questionable inclusions, however, taking up space that might have been better filled with more 'essential' sounds. Yes, we're looking at you, Bowed Cymbals and Box Organ. Also, the only all-new sample set in the package, Intimate Piano, isn't terribly exciting - a thoroughly standard piano in regular and "extra dreamy" versions. Like its predecessor, Orchestral Essentials 2 is geared up to give sonically impressive results at maximum speed with minimum effort.